Whilst our gorgeous designs may look wonderful on your walls, they can also be used in other areas of the home for a quirky, alternative twist to your interior design. In previous blog posts we’ve discussed how you can use our wallpaper for seasonal decorations, but there are plenty of other practical ways to spruce up your home without papering all of your walls. Whether you’re working with leftovers and offcuts, or you’re buying a fresh roll to get creative, we’ve put together some top tips and inspiration ideas to fuel your next project. Depending on where you’re applying your wallpaper, you’ll need the correct type of glue for the job. It sounds simple, but that dry glue stick that’s lurking in the back of your stationery drawer is certainly not fit for the job! Consider purchasing a reliable waterproof adhesive. An all-purpose glue will allow you to stick your wallpaper to anything from wood, to glass and even material. 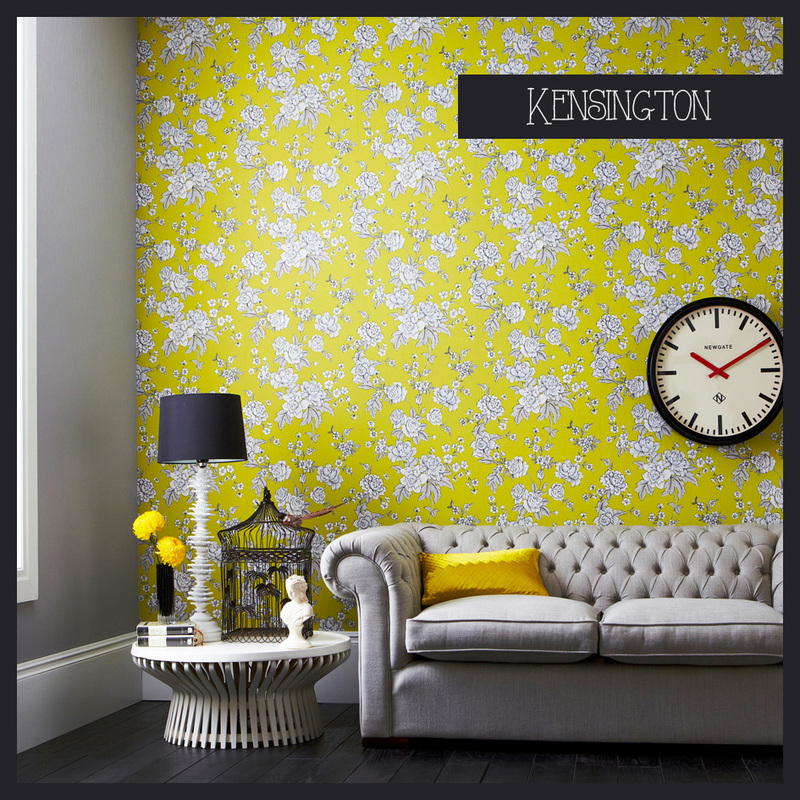 There are many ways to brighten up your kitchen wall with a few bits of wallpaper. For a flash of colour, why not choose a vibrant, contrasting design to line your cupboards and drawers? Every time you open your cupboards you’ll be greeted with a cheerful burst of uplifting colour, perfect for quelling the stress you feel when cooking a meal for your entire family! This stunning lined bookcase would look perfect in your living room and provides an easy way to update a mundane feature in your home. Perhaps you could even have a different design for each compartment to reflect what type of books are kept in each section? 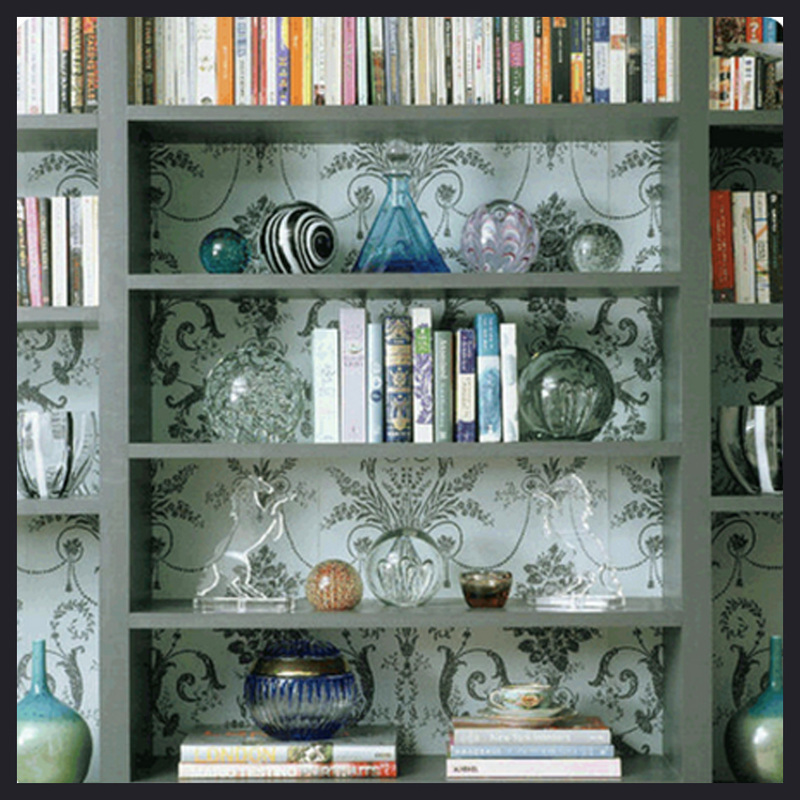 Remember, the idea is to make your bookcase stand out, so don’t be afraid of applying a design that is completely different to your current wallpaper. Forget about borders and dado rails, there’s an even more impressive way to jazz up the passageways of your home. 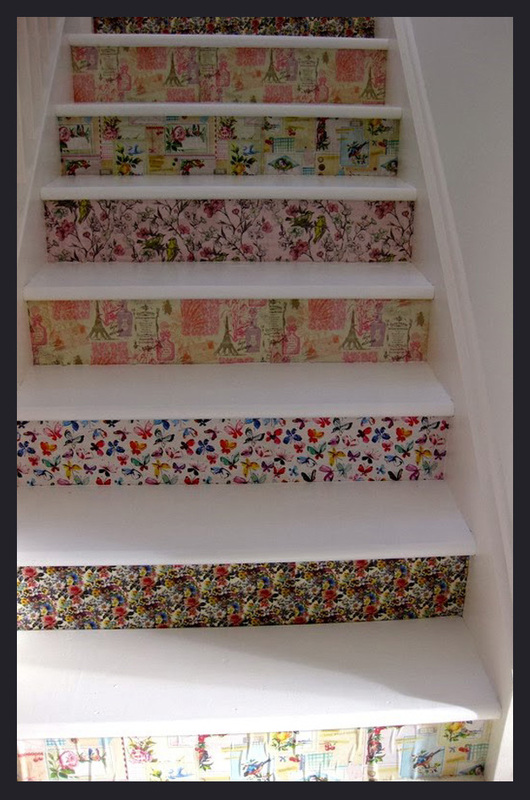 This beautiful staircase features a small strip of wallpaper on each step and creates a kitsch, ‘doll house’ style, completely transforming the look and feel of your home. If you have a wooden staircase that has seen better days, but you can’t face the task of sanding down and lacquering each step, this could be a faster and more affordable alternative. Simply paint your bannister and steps in a neutral shade, even white will do, and get to work with the most wonderful patterned paper you can find. Although each step doesn’t need to match, you should try and stick to similar colours for a running theme that will pull the look of your staircase together. 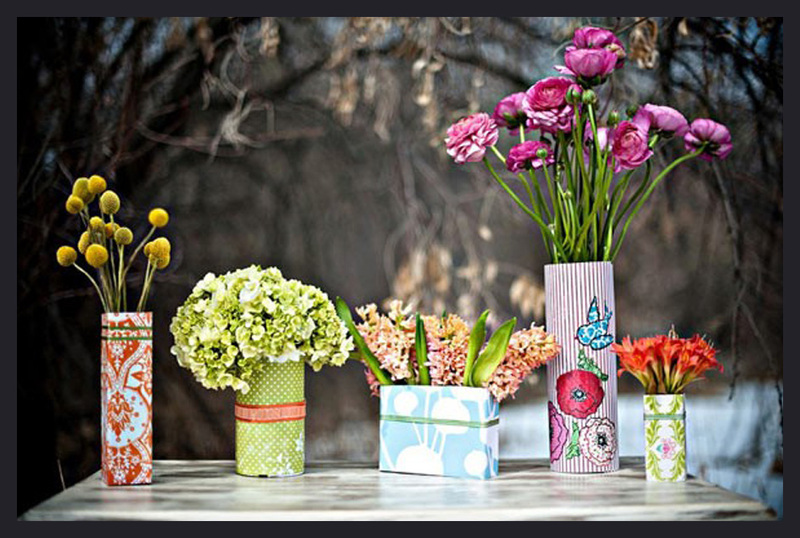 Upcycle some old containers and tin cans to create gorgeous homemade table decorations, such as vases. A little bit of wallpaper can go a long way when you’re creating these wonderful centrepieces. Intricate patterns work wonderfully on these stunning recycled pots, so pick eye-catching designs that will draw your guests’ attention to your hand-crafted feature. So what are you waiting for? We’ve given you plenty of ideas to get you started, but this is just the tip of the iceberg! From lampshade coverings to wallpaper headboards, the possibilities are endless when you let your imagination run wild.